Graham Hay, Artist in Residence at Tranby College, created four sculptural seats from more than 20,000 pages of paper and 2000 bicycle spokes. 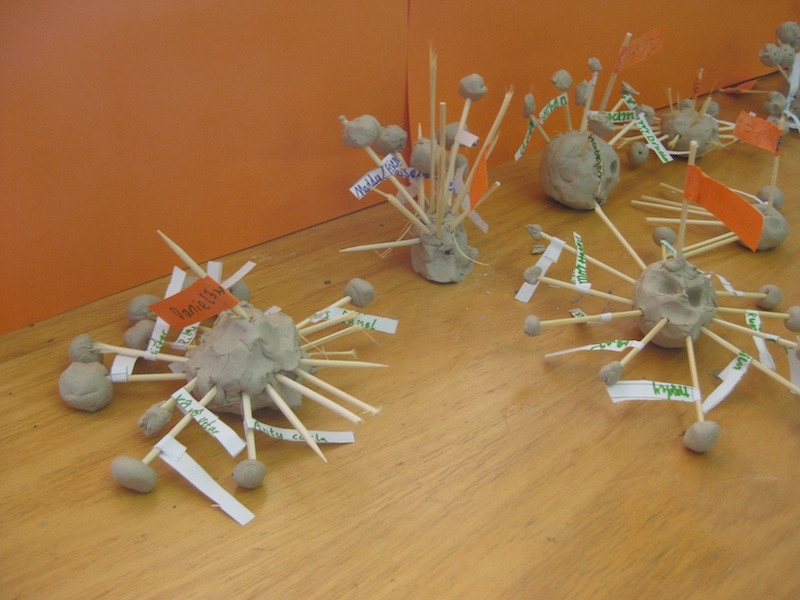 This Social Network Analysis Visualisation inspired public art was created at the school May - October, and then at the Robertson Park Artists Studio, Northbridge, October to December 2014. 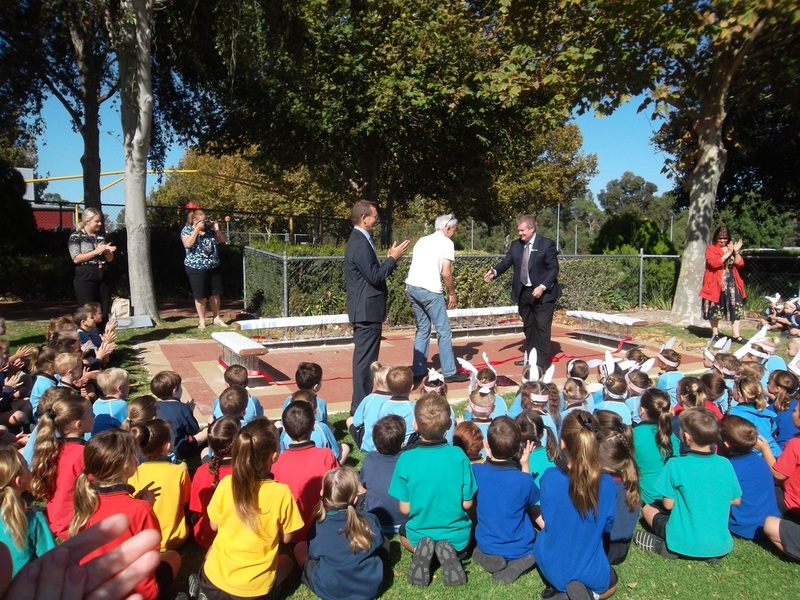 Finally in March 2015, brick paving was laid, the seats were installed, and officially unveiled on Thursday 2 March. Traditionally we are encouraged to see ourselves as a single person with set characteristics. An emerging way of thinking is that we are actually best understood as the sum of the characteristics of our relationships. "Social network analysis visualisation” has huge ramifications for emotional well -being and stability, pedagogy, vocational selection and our adapting to new technology. This Art Project will sensitise students and staff to this way of thinking and seeing the world around them, like spokes on a wheel fine tuning our multiple relationships for the smooth running of organisations, families and autonomous individuals. 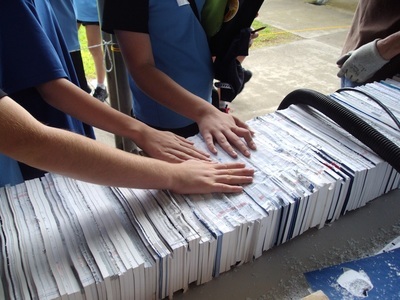 Over the last two decades I have developed a unique way to recycle old annual reports into an artificial “hardwood”. 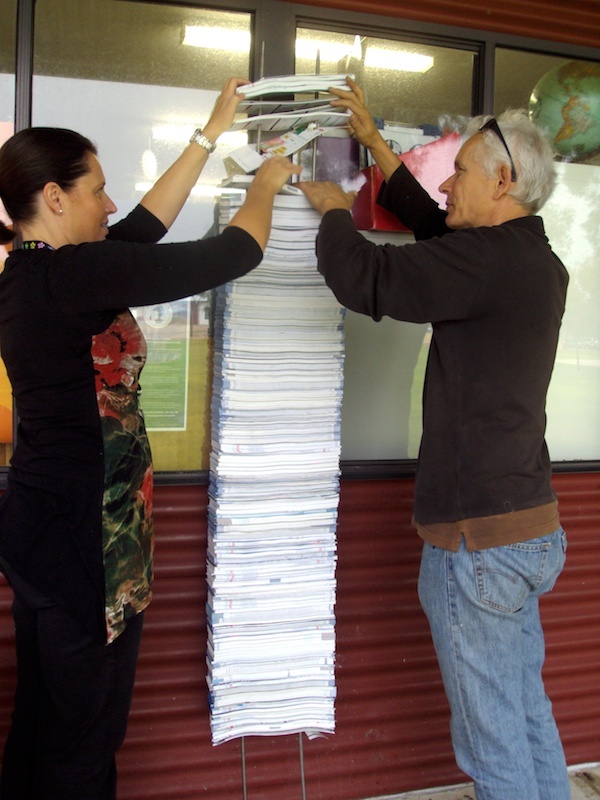 I use modified hardware materials and tools to compress thousands of paper pages together to make small to huge 3 tonne outdoor sculptures. See some of these paper sculpture here. A description of my process is here. My art is inspired by my researched of the social networks in the Western Australian arts community over the last 30 years. More recently an emerging academic research area, called Social Network Analysis (SNA) has emerged. This now provides a theoretical framework for my ongoing work. With the new online Social Media (think Facebook, Twitter, Instagram, Snapchat etc) we are all beginning to see our family and friends as separate visual networks(these are great images for everyone to look at). For myself, a good starting point to show these ideas as sculptures, was our uniquely Western Australian Banksia tree flower, with hundreds of tiny flower heads. Unaware of this, many people think my ceramic paper clay sculptures were inspired by sea coral. See for yourself some of my ceramic paper clay sculptures here. The compressed paper work is both a by-product and comment on our increasingly text and information dense lives. There is no escape the “paperwork”, it is now an essential part, or foundation, of every life, even that of an artist such as myself! I exhibited a 1 metre tall circle sculpture made from compressed paper in the 2009 Sculpture by the Sea (SxS) exhibition on Cottesloe Beach. 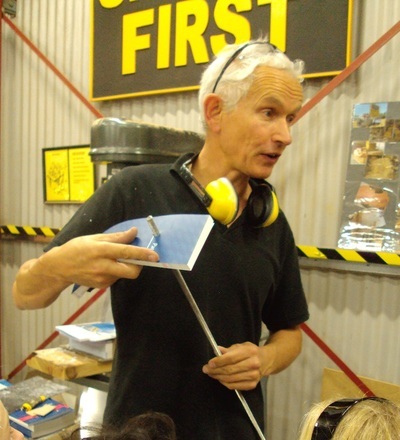 During the exhibition I gave a number of workshops with groups of school children, including pupils from Tranby College. As a result of this I was invited to give further paper clay workshops at the school with pupils and staff in August 2009. 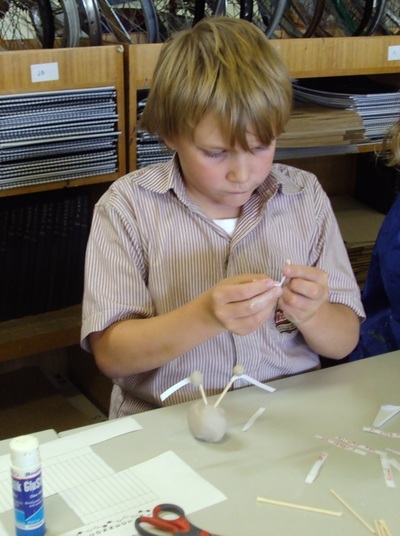 Perhaps due to “a definite "glow" in the art room” after my first visit, art specialist teacher Gill King contacted me again in September 2013 to explore either another artist in residence or sculpture for the school. Gill was particularly keen to “investigate the idea of students working collaboratively on some sort of sculpture we could install in the grounds…”(emails). In October 2013 we meet at the primary school and developed this idea and timeline. I noticed some worn barriers around a small lawn at the school, where students appeared to gather, and suggested a combined compressed paper and bicycle spoke seat. This was linked to Social Network Analysis at a level relevant to the students, highlighting their personal network and importance for mental health. 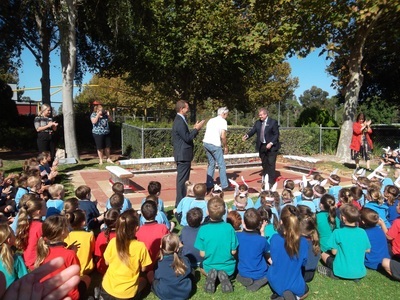 With the support of the Head of Junior School, Graham Badge, the project received the go ahead. 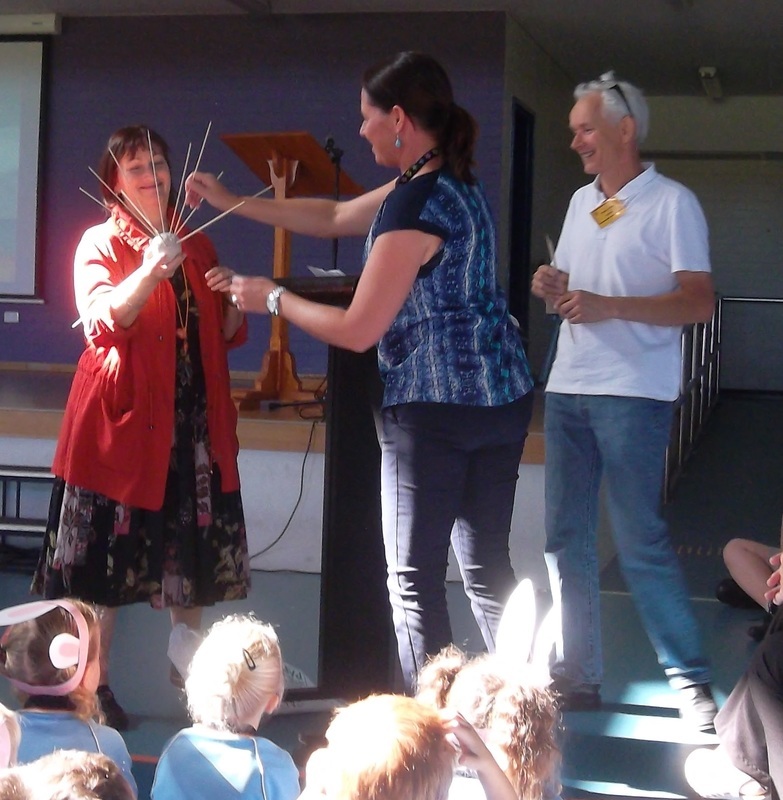 Ms King organised the collection of old bicycle wheels (for the seat supports) from the school community and other sources, while I contributed over 200 annual reports (for the seat tops) and 44 one metre long stainless steel threaded rods (to hold it all together). Jason, from Malaga Cycles bike shop, also tracked down some surplus wholesale spokes to add to the spokes already removed by the students from the collected old bicycle wheels. On Friday 2 June, Ms King and I introduced to a trial class the Social Network Analysis ideas. A bicycle wheel was used to illustrate how the many, very, very thin spokes collectively support the bicycle, and that a broken or damaged spoke is seldom catastrophic, and the wheel will continue to work, simply by putting more weight on nearby spokes, and then later replacing the broken spoke. 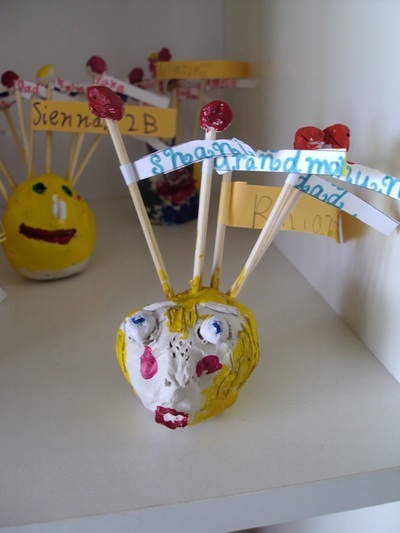 The students then listed and attached the names of all their extended family and friends (school, sport, neighbourhood, holiday) to “spokes”(wooden kitchen skewers), which they attached to small clay self portraits. Ms King repeated this lesson with her other art classes. 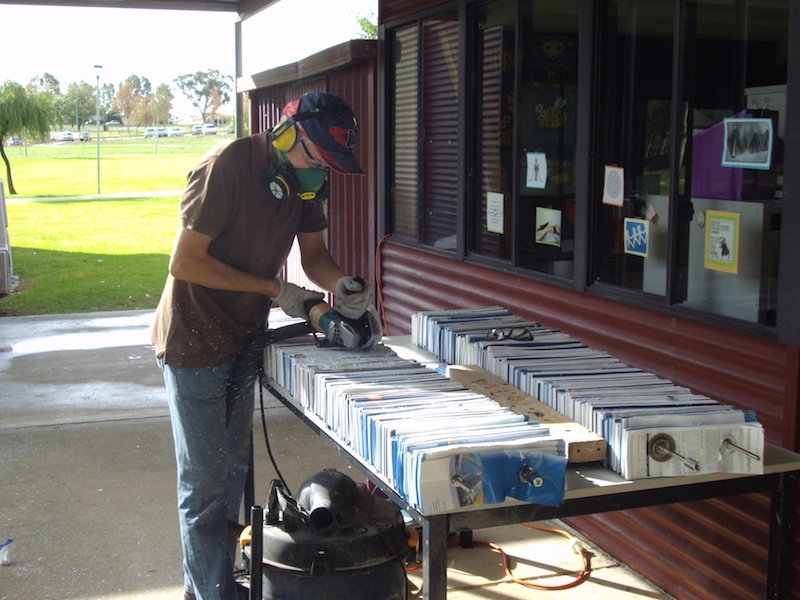 On the 12 and 15 June the Tranby College Woodwork Teacher, Gary Murfet, kindly allowed me to use the senior school woodwork classroom equipment to drill over 16 metres of paper, and cut it into 10 cm wide strips. While I did this, junior class groups came down to watch and listen to me. 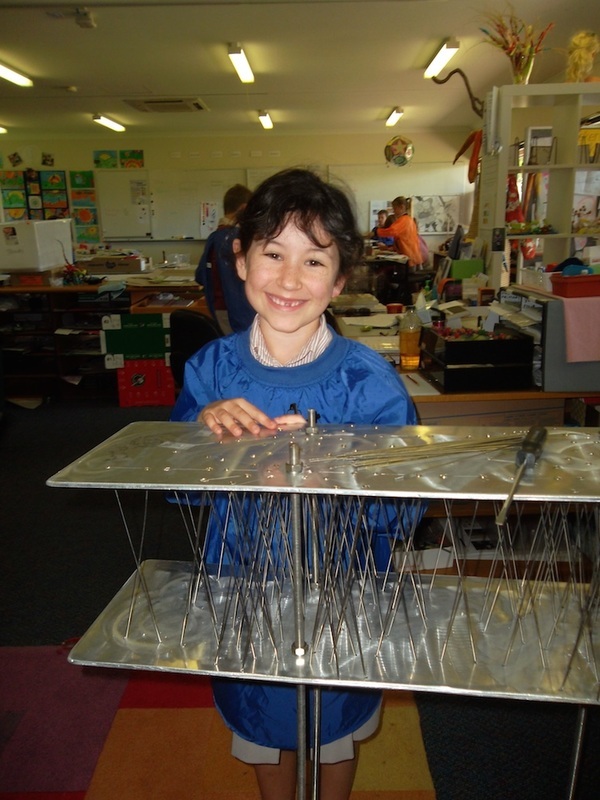 Then, in the classroom with Ms King and Art technician Leonie Hanna, they threaded and compacted the paper onto 16 one metre rods. On the 20th and 29 May and 2 June we joined the sections together to make the four seat tops. Then I begun cut back and begun to sand them smooth with the power tools. Special thanks to Craig Pudney, groundsman Ian Russell and Principal Matthew Ivulich, for tools, assistance, and interesting conversations. Over the previous weeks in my Northbridge studio I cut, drilled and smoothed aluminium sheets to go under each seat, and to which over 2000 spokes will be attached. I sought informal advice from a structural engineer on number and angles for the spokes. It was a challenge juggling the structural requirements as well as making a pattern which reflected the social network ideas. As I drilled over 1000 holes for the first seat, the idea for the pattern of spokes for the next seat came to me. After the first two seats designs were completed, I felt confident enough to plan for multiple length spokes. 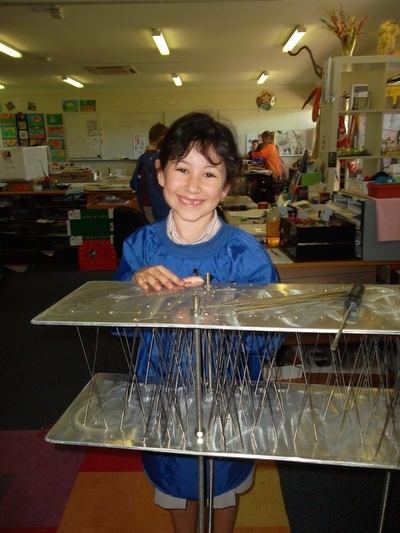 Once drilled, the aluminium sheets were attached to the vertical threaded rods and delivered to the school with plans for the threading of the spokes. A special thank you to the children and parents who undertook this complex task. Meanwhile, back in my studio I contemplating and then sculpt the compressed paper sections slightly more organic. Thanks to musician Ronnie Domp, and friend Joe Francis, for transporting sections 50 km from my studio back to the school. Builder and paver Jamie Dee cleared the grass, brick-paved the site, and on assisted me install the seats on Saturday 14 March. Other projects I worked on concurrently, include two 300 piece porcelain and compressed paper sculpture for the 2014 Dublin Biennial, and two, 2m high 3,000+ stone phone cairns. To assist parents to understand how their children’s learning will depend more and more upon network thinking please view this short video https://vimeo.com/42567012. If you have 10 minutes, please watch the first half of the Manuel Lima video. It suggests ways we can face the challenge of learning in an increasingly complex world. Well worth a little of your precious time. No art is truly made in isolation. In this case a large number of people contributed their ideas, resources, time and effort to create this project. See if you can find and write down the names of people I have listed in the above text, who have all generously helped me by contributing their valuable time, ideas and resources towards this project. ​Who do you think I have missed out? 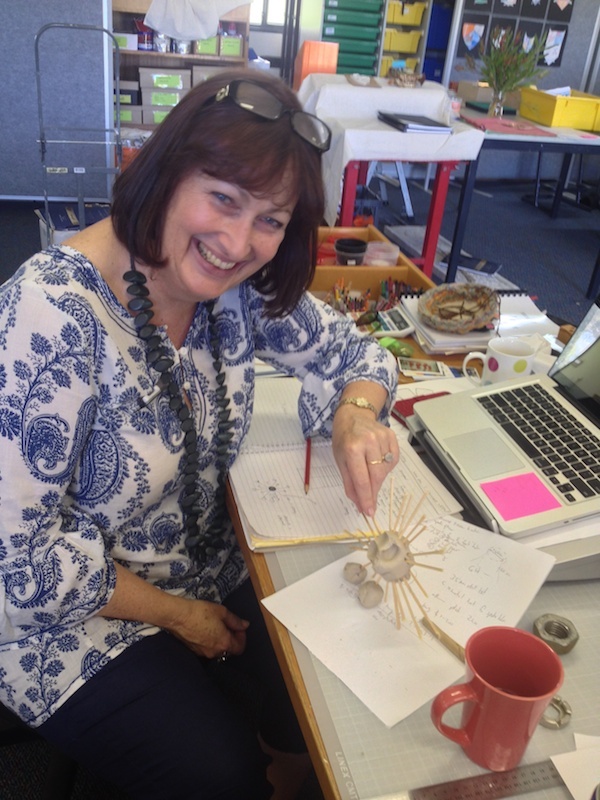 Art specialist teacher Gill King with the first SNAV model prototype. Students illustrating their own personal Social Network Analysis. Some of the students sculptures. 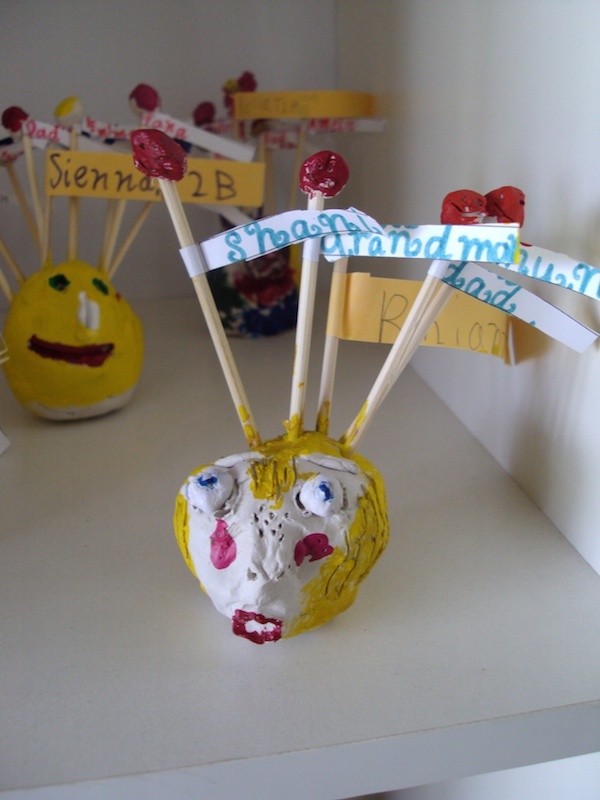 The painted and finished student's SNAV of their own networks. 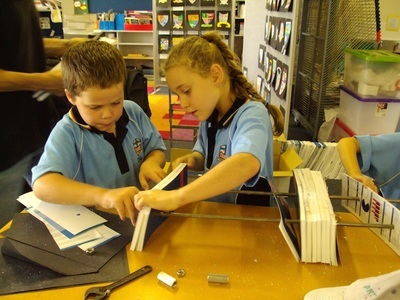 Tranby College primary students thread paper onto steel rods. Art Education Assistant Leonie Hanna and artist Graham Hay compact the paper onto the rods. Graham begins to smooth the compacted paper sections. Students feel the smooth paper seats. 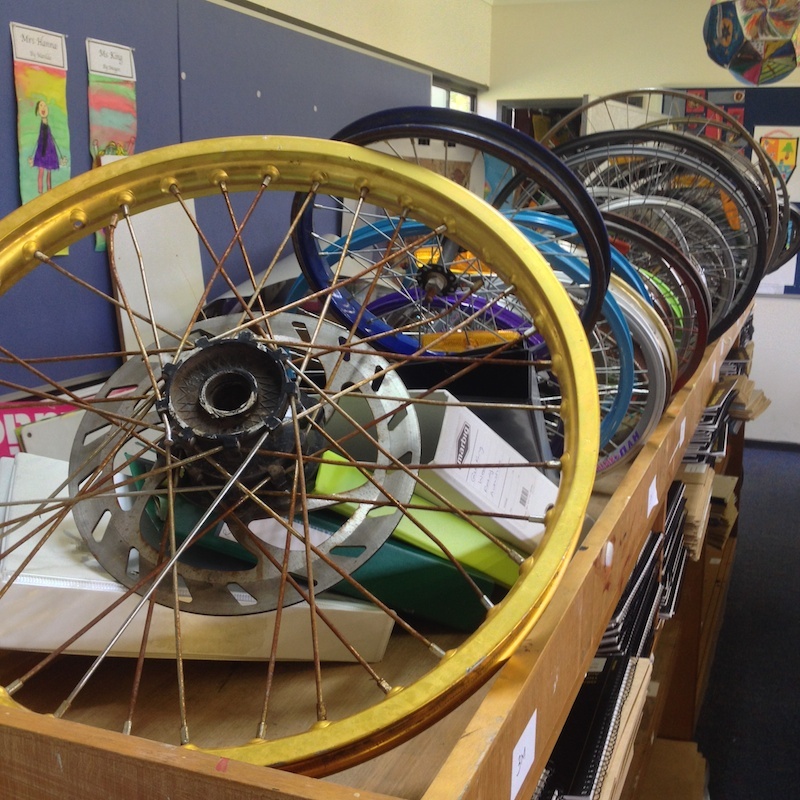 Some of the many donated bicycle wheels. 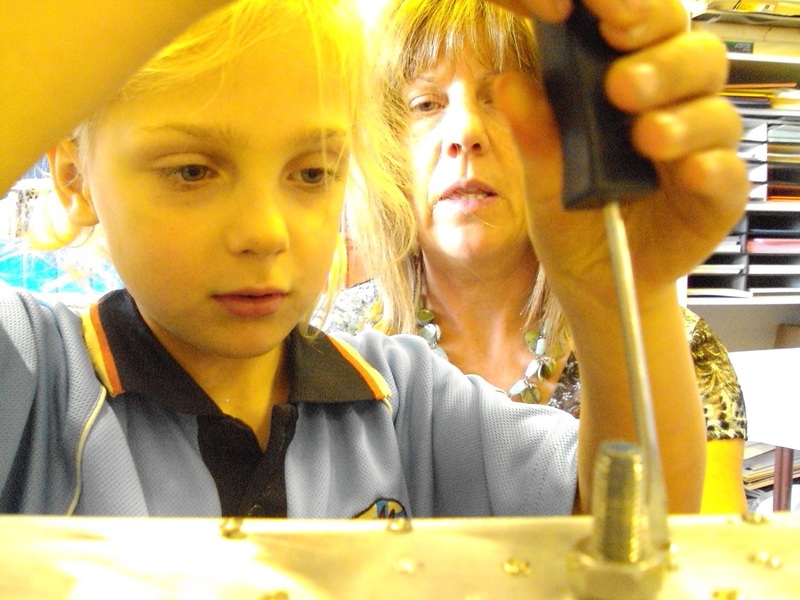 Students, and parents and staff, removed the spokes. 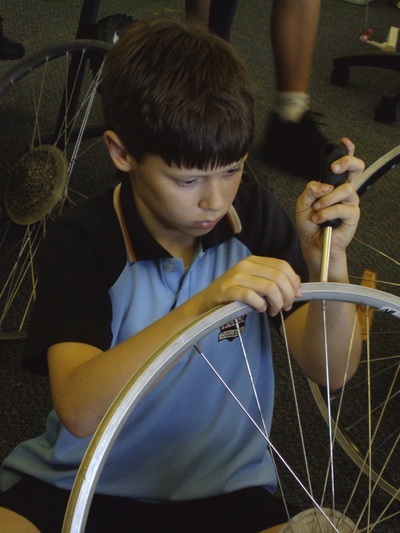 A student examining the assembled seat base, with the threaded spokes. During the Easter Service we re-enacted the creation of the social network which created the artworks. After the service the seats were formally opened with a ribbon cutting and unveiling of a brass plaque. Photos supplied by the school, after gaining parental approval.